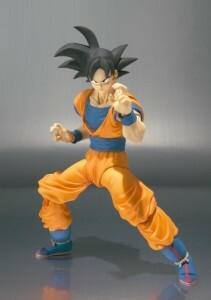 The long awaited S.H.Figuarts figure of Son Goku Normal version will soon be available. It’s going to be released in Japan this February in very limited numbers and then in March be shipping from Amazon.com. The Normal Figuarts Goku figure is one of the most wanted figures in the series as it’s been teased at numerous conventions all over the world in the last few years and is finally up for pre order on Amazon. It’s likley going to sell out way before it ships but hopfully will be available in a second and third wave later on in the year. It’s worth noting this version of Goku comes with a few accessories but not a red head of hair to go super saiyan god and fight a figuarts Birusu. With this figure being in such high demand it’s likley going to get a few variations in upcoming re released.